Why write your address over and over, when you can simply stamp it with a Trodat Professional Name and Address Stamp. Our Custom 5 Line Trodat Professional Name and Address Stamp has a generous text plate size of 1-1/8" x 2" and allows you to create up to 6 lines of customized text. This means you get room for a standard 3 line name and address, plus 2 extra lines for things like email, website or phone number. 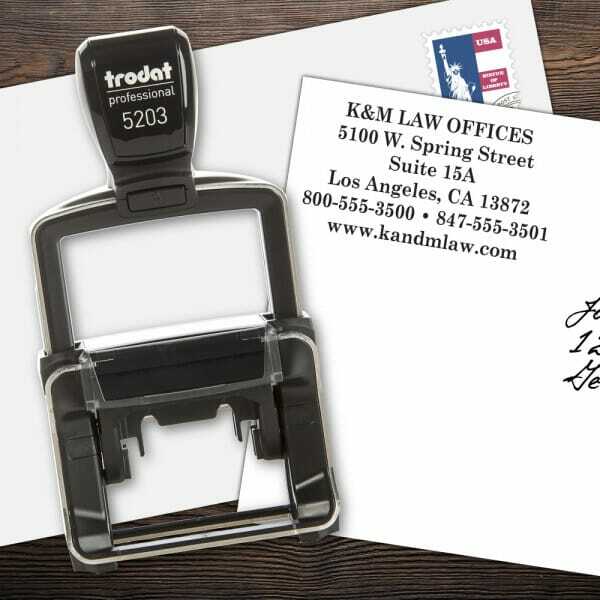 The new Trodat Professional 5203 4.0 self-inking stamp is perfect for everyday use at home, or in your busy office environment, thanks to its new brushed stainless steel finish and high quality plastic build. An elegantly designed, self-inking rubber stamp with an integral replaceable ink pad that can be personalized with your own design. Low on ink or want to have extra pads handy? Replacement ink pad 6/53 is available in 5 standard colors: black, blue, red, green or violet. Customer evaluation "Custom 6 Line Trodat Professional Name and Address Stamp"